Cheers to Our Health in 2012! With over $2 Trillion dollars being spent annually in the U.S. to manage chronic disease it is safe to conclude that there are a lot of people feeling terrible. Yet, we know that chronic disease can be reversed and even eliminated by lifestyle changes. 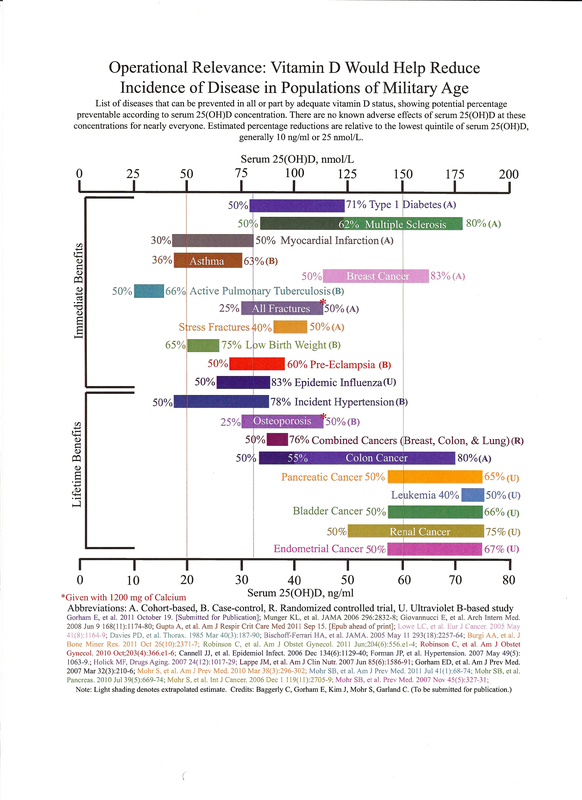 The chart below illustrates blood serum concentration of Vitamin D relative to the percent of prevention available for specific chronic diseases. Investing $65 dollars in a simple blood test for Vitamin D levels is intelligent self-care. ZRT Labs and the Vitamin D Council makes this process easy with a test kit available by mail. Mine will be arriving this week. This test can also be ordered through Grassrootshealth.net where you can volunteer to particpate in a Vitamin D study. This non-profit is headed by Carol Baggerly, a breast cancer survivor passionate about Vitamin D and prevention. The list of chronic diseases preventable with Vitamin D is astonishing. The only way to reduce the crushing costs of health insurance is for us all to be healthier. Employers incentivizing smoking cessation, weight management, and healthy heart programs would do very well by adding the management of Vitamin D blood serum levels to this basket. Latest research verifies that managing vitamin D concentration is a stellar act of prevention. Take note Aetna, Blue Cross et. al. this is a huge opportunity to improve your bottom line without “rationing” health care! Previous Previous post: What’s Your Gift?